(Nanowerk News) An international team of astronomers, including Carnegie's Eric Persson, has charted the rise and fall of galaxies over 90 percent of cosmic history. Their work, which includes some of the most sensitive astronomical measurements made to date, is published by The Astrophysical Journal ("The FourStar Galaxy Evolution Survey (ZFOURGE): ultraviolet to far-infrared catalogs, medium-bandwidth photometric redshifts with improved accuracy, stellar masses, and confirmation of quiescent galaxies to z~3.5"). The team assembled the colorful photo album by using a new set of filters that are sensitive to infrared light and taking images with them with the FourStar camera at Carnegie's 6.5-meter Baade Telescope at our Las Campanas Observatory in Chile. They took the images over a period of 45 nights. The team made a 3-D map by collecting light from over 70,000 galaxies, peering all the way into the distant universe, and by using this light to measure how far these galaxies are from our own Milky Way. The deep 3-D map also revealed young galaxies that existed as early as 12.5 billion years ago (at less than 10 percent of the current universe age), only a handful of which had previously been found. This should help astronomers better understand the universe's earliest days. "Perhaps the most surprising result is that galaxies in the young universe appear as diverse as they are today," when the universe is older and much more evolved, said lead author Caroline Straatman, a recent graduate of Leiden University. "The fact that we see young galaxies in the distant universe that have already shut down star formation is remarkable." 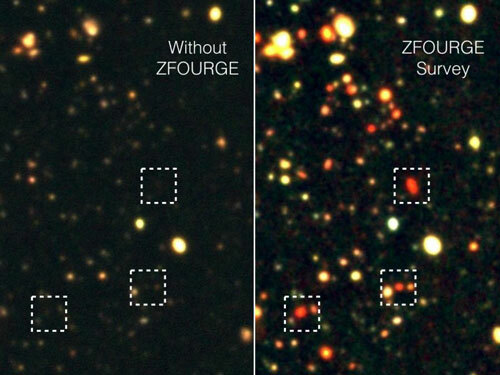 But it's not just about distant galaxies; the information gathered by ZFOURGE is also giving the scientists the best-yet view of what our own galaxy was like in its youth. "Ten billion years ago, galaxies like our Milky Way were much smaller, but they were forming stars 30 times faster than they are today," said Casey Papovich of Texas A&M University. 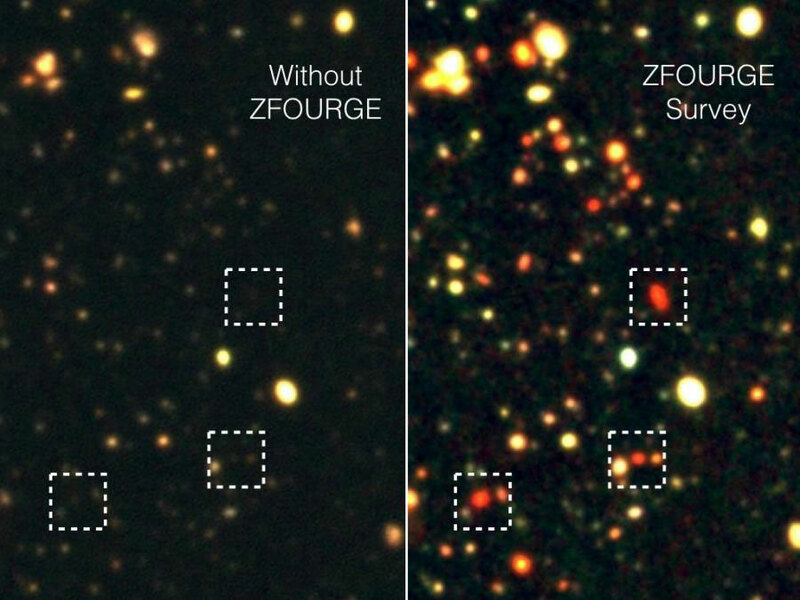 "ZFOURGE is providing us with a highly complete and reliable census of the evolving galaxy population, and is already helping us to address questions like: How did galaxies grow with time? When did they form their stars and develop into the spectacular structures that we see in the present-day universe?" added Ryan Quadri, also of Texas A&M. In the study's first images, the team found one of the earliest examples of a galaxy cluster, a so-called "galaxy city" made up of a dense concentration of galaxies, which formed when the universe was only three billion years old, as compared to the nearly 14 billion years it is today. "The combination of FourStar, the special filters, Magellan, and the conditions at Las Campanas led to the detection of the cluster," said Persson, who built the FourStar instrument at the Carnegie Observatories in Pasadena. "It was in a very well-studied region of the sky--'hiding in plain sight.'" The paper marks the completion of the ZFOURGE survey and the public release of the dataset, which can be found here.